Pulling into the state park 12 miles west of Lebanon, MO, all appears normal. Then the amount of vegetation in the stream appears excessive. There is the sound of an outboard motor. It is an unusual situation because the Missouri Department of Conservation does not allow boats in the trout fishing area. This is going to be a strange day of trout fishing. The Department of Conservation releases Rainbow Trout into the stream daily during the months of March through October and anglers flock to take part in the excellent opportunity to catch good sized fish. Today the anglers are leaving as they meet in the parking lot and discuss the situation. The stream divides into three zones for fishing. Zone 1 runs from the Hatchery Dam upstream to the end of the trout fishing area. Anglers who are fishing with flys only are permitted in this zone. Zone 2 runs from the Hatchery Dam downstream to the Whistle Bridge. Only flys and artificial lures are allowed in this zone. Zone 3 runs from Whistle Bridge downstream to the Niangua River. Only unscented soft plastic baits and natural and scented bait is permitted in this section of the stream. All flys and artificial lures are not permitted in Zone 3 even if natural or scent is added. The normally pristine stream is choked with what appears to be coontail. It is great cover for trout but a mess for the angler. 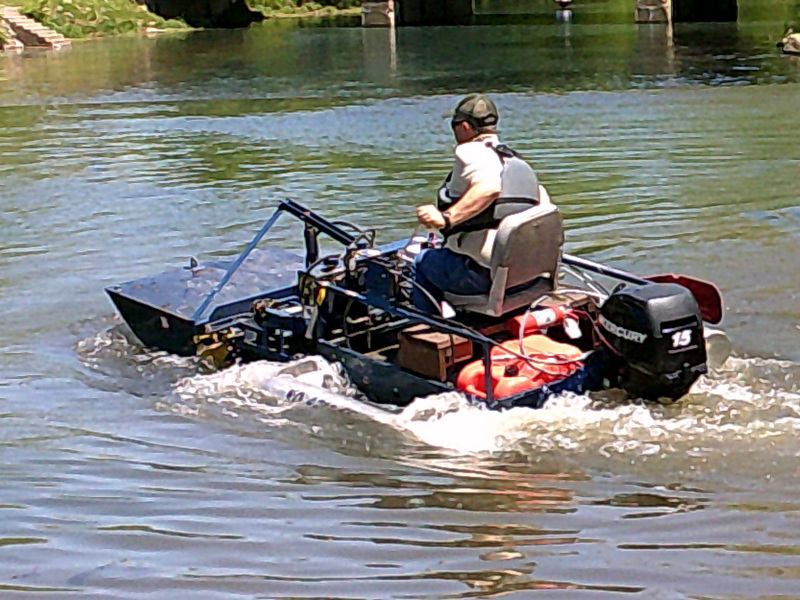 And what about that outboard motor? It only takes a few casts before anglers give up and head for the lodge for lunch and some explanation. On the way to the lodge parking lot the answer to some of the problem is on display for all to see at the dam and below it. The Department of Conservation employee was going back and forth across the stream on a small boat equipped with a cutting blade on the front, below the water. The rig was chopping up the vegetation which then washed over the dam. The noise of an outboard on the back of the boat was stirring up any fish in the water. Below the dam anglers were also giving up as the vegetation washing toward them was getting entangled in their lines. The water that is clear of vegetation is a different shade of green but does not amount to a lot of fishing area at this time. Later after lunch more area is open and the fishing picks up. The work done by the Department of Conservation has kind of ruined the fishing for today. But, there will be others. As the sun sets it is time to pack up and head for St. Louis. The name is intriguing. Do you launch crickets into the air to fall again to the surface of the water? Maybe you just launch them across the surface. Whatever the use, the first seminar at the Mid-South Boat Show on Saturday morning is Thomas Cauley and how to use the Cricket Rocket. Listening to his explanation of how to use the rocket, dreams of summer days on the pond fishing for bream (bluegills) and other sunfish flood back into my consciousness. Brought back to reality by his asking if I fish for bream, I nod and he tosses one of the Cricket Rockets. As getting older and due to a recent hunting injury, my left hand is not really effective in handling crickets. Many of them escape from my cricket cage into the boat and into my tackle. Those I managed to get on a hook are often dismembered in one way or another. 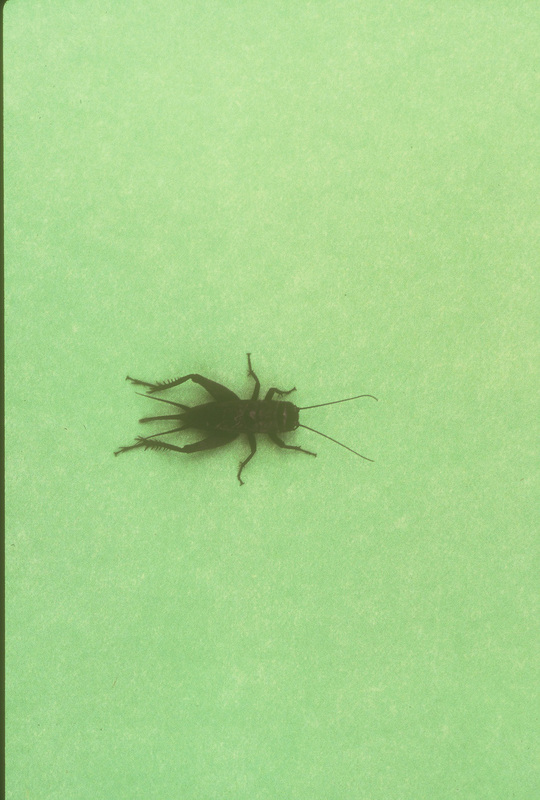 The fragile bodies of crickets do not hold up well as bait for anglers. This gadget sees to make up for clumsy anglers. It also allows one to handle one insect at a time. Baiting a hook is done is four steps. Load the appliance with crickets. Shake one into the nozzle. Set the hook the through a hook slot in the nozzle. Press the release trigger and you are ready to fish. Cauley points out that you can place a few crappie minnows in the tube. The same procedure will admit a crappie minnow in the same way. The rest stay in the Cricket Rocket placed in your live well. The Cricket Rocket website at http://www.cricketrocket.com has detailed explanations of the appliance’s use. Illinois anglers can find good early season bluegill action on farm ponds providing they pay attention to the tackle, the presence, absence, and location of vegetation. Very dense vegetation reduces predation and as a result has an adverse impact on fish populations. The increase in the young‑of‑the‑year survival leads to an increase in stunted fish. If the pond is on your property, you might think about using a garden rake to remove some of the vegetation. This is not to say that you need to destroy all vegetation. You just need to thin it. Plants are important in that the microscopic ones form the base of the aquatic food chain. Larger algae and plants provide spawning areas, food, and protective cover. They provide habitat for insects and snails. Emergent plants and near shore submerged plants protect against erosion of the shoreline. All plants produce oxygen. 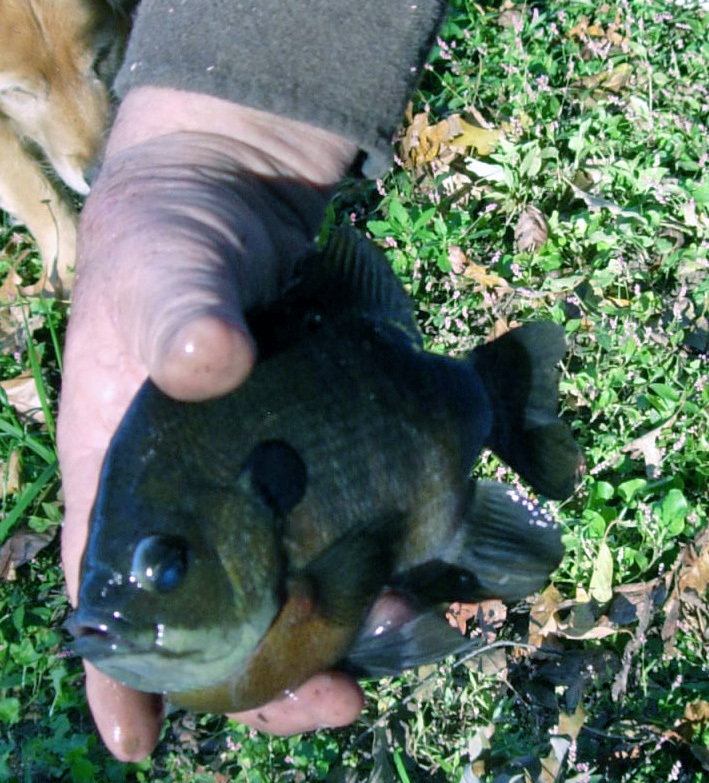 Algae growth is the main vegetation that presents problems to good bluegill growth. It comes in two forms phytoplankton and in mats of filamentous algae. Often problem growth relates to the phosphorus content of the pond. Bluegills prefer water that is deep and clean as well as having a pH of 7.2. Vegetation prefers similar conditions. Ponds abound throughout Illinois providing one or more of these factors and containing healthy populations of fish. Early season water warms in response to the increasing hours of daylight. Sheltered areas exposed to sunlight are the first to show signs of plant growth. One of the reasons vegetation is important in fishing a pond is the lack of structure in the bottoms of such waters. Most are smooth bottom waters with no distinct cover other than the vegetation. Fish will be scattered. Anglers spread their efforts until they are able to locate the fish. By casting to different areas and adjusting the depth at which they are fishing, fish can be located. If an overflow pipe is available, work the area around it carefully. A pond constructed by a dam between two hills should have a channel in the middle. There may be rocks and stumps near the edge of that channel which will attract fish. Sometimes a previous angler might have placed a fish attracter, such as a clump of Christmas trees. Once located, the angler can focus his efforts around it. Casting lures or pitching a live bait offering to any piece of structure often produces that first fish. Early in the year, bluegills feed on the vegetation in the shallows. Anglers should stalk them in their feeding areas. They feed slowly. A slow presentation of ice fishing spoons and jigs works well under these conditions. Baits such as spikes, wax worms, etc., can be added to a lure. Another presentation can be a salmon egg hook with a single split shot about 12 inches above the hook. Add live bait to the hook and you are in business. As water conditions warm, the bluegill’s appetite increases. Scientists have found that bluegills tend to prefer water that has a temperature of 86 degrees or less. Most often they prefer 77 to 79 degrees. Smaller fish prefer slightly lower temperature water. This is not to say that they are not active feeders at lower temperatures. The fact that ice anglers catch bluegills all winter long attests to that fact. In colder water, tip lures and hooks with a bit of bait fish meat or even small minnows. The use of a slip bobber allows the angler to make his presentation at any desired depth until he finds the schools of fish. If the bait or lure is presented deeper, the split shot should be moved further from the bait up to a maximum of 20 inches. Light tackle is a must in bluegill fishing regardless of the time of the year. Spinning reels on ultralight rods should be spooled with 2 to 6 pound test line. The clearer the water, the lighter should be the line. Some tips to remember are: 1) work the edge of the cover. 2) If working heavy vegetation, set the hook quickly to keep the fish on the surface until you can get it in open water. 3) When the sun is high, work deeper in the vegetation. 4) As the light becomes low, work the edges. Bluegills in a pond may seem like easy fishing. With the right tackle, this can be a challenging, exciting, and fast‑paced action. Good eating too! The opening of turkey season is a time of emerging interest in the many acres of public access lands. Each spring turkey hunters prowl the woods in search of lovesick gobblers. Southern Illinois contains approximately 350,000 acres of huntable turkey territory. Hunters fan out throughout those public lands to hunt their favorite locations. Nesting success has been good in the area and local residents report seeing large flocks of birds all through the winter. Of particular interest to turkey hunters are the expansive 277,000 acre Shawnee National Forest which offers the single most tract of turkey habitat in Illinois. Hunter success has traditionally been very high in the forest. Other state and federal lands are also available for turkey hunting in southern Illinois. A complete list of public hunting lands is in the Illinois Department of Natural Resources Hunting Digest. It is available free at locations that sell hunting licenses, from all Department offices throughout the state, and on the IDNR website. Spring turkey hunting is gobbler hunting. The male birds gobble to attract hens for mating. The birds mate, and the hen goes her own way. Once she is successfully bred, the hen will make a nest, lay eggs, and raise a brood of young. If the breeding was not successful, she will seek out another gobbler with which to make. Hunters seeking turkeys should be sure that they learn how to hunt turkeys before taking to the field. Consistently successful hunters are those that scout the birds prior to the season. They find sign of the bird’s activity such as feathers, droppings, dusting areas and tracks. You can sight birds from roadways with the use of binoculars. Another way of locating birds in the spring is with the use of a “shock gobble”. Male turkeys will sound off when hens are in the area. He thinks he is king of the woods during this period and will offer a challenge gobble in response to almost any sound. The sound can be the gobble of another bird, the hoot of an owl, or even the slamming of a car door. In the early morning and late afternoon, turkeys move to areas where two types of vegetation converge. This can be grass, pasture, crop fields, brush or woods. They frequent fence rows, roadsides, weedy ditches, abandoned roads and old railroad rights of way. It is important to remember safety always when in the woods turkey hunting. Turkey hunter will be sharing the woods with mushroom hunters during at least part of the season. Safe hunters are those who hunt in the traditional fashion by calling birds to a point where a clear kill can be made of a clearly identified target. A hunter’s knowledge of proper hunting techniques and familiarity with the birds’ habits can be helpful in promoting safe hunting. Turkey hunters can gain information about the sport from the National Wild Turkey Federation. Information is available on line at: www.nwtf.org. Information about turkey hunting is Illinois is available from the Illinois Department of Natural Resources, One Natural Resources Way, Springfield, IL62702-1271. Their website address is http://dnr.state.il.us. Early life is the most hazardous time for young turkeys. An important sign of turkey population success is whether the young live through the summer. If conditions are right one year, the number of birds making it to the next spring will be greater. By watching brood conditions in your area it is possible to plan for next year. Continued flooding hurts the turkey nesting along flood plains. Any decreased gobbling makes finding those birds more difficult. Spring turkey hunting is gobbler hunting. The male birds gobble to attract hens for mating purposes. As the weeks continue into the latter part of spring, there are fewer female birds to be attracted to the gobblers. Gradually, the season winds down. It is this decline in mating activity that is believed to be the cause of fewer birds being taken later in the season. Wind and rain can also affect turkey harvest in the spring. Besides being a detriment to hunters taking to the field, wind and rain can sometimes cause the birds to react differently to a call. Turkeys do continue to practice their mating rituals regardless of weather. Nesting success is dependent upon weather in late May and early June. Below‑average temperatures and very wet weather causes poor nesting success. Good conditions lead to at least two years of excellent hunting. However, it will be two years before those birds are gobbling. Jakes (yearling males) do not gobble the first spring after their birth. They will come to calls but do not gobble. They often surprise a hunter who is unaware just how close they are to him. It is important that the hunter learn how to hunt turkeys before taking to the field. There are those hunters who take birds year after year, and they are the ones who get out in the field and scout the birds before the season begins. Successful turkey hunters scout areas to find turkey sign. They look for dusting areas and tracks on back roads. By driving the back roads, one can see tracks of birds traveling across the road and near creeks. You can spot birds by use of binoculars. By looking for movement then using binoculars, one can identify turkeys. He can determine the number of birds, number of gobblers and number of jakes. That helps to find that specific gobbler with the long beard. In the early morning and late in the afternoon, birds feed. Birds move to the edges. Edges are areas where two types of cover converge. This can be grasses, pastures, crop fields, brush or woods. Some other areas to inspect are fence rows, roadsides, weedy ditches, abandoned roads and old railroad rights of way. 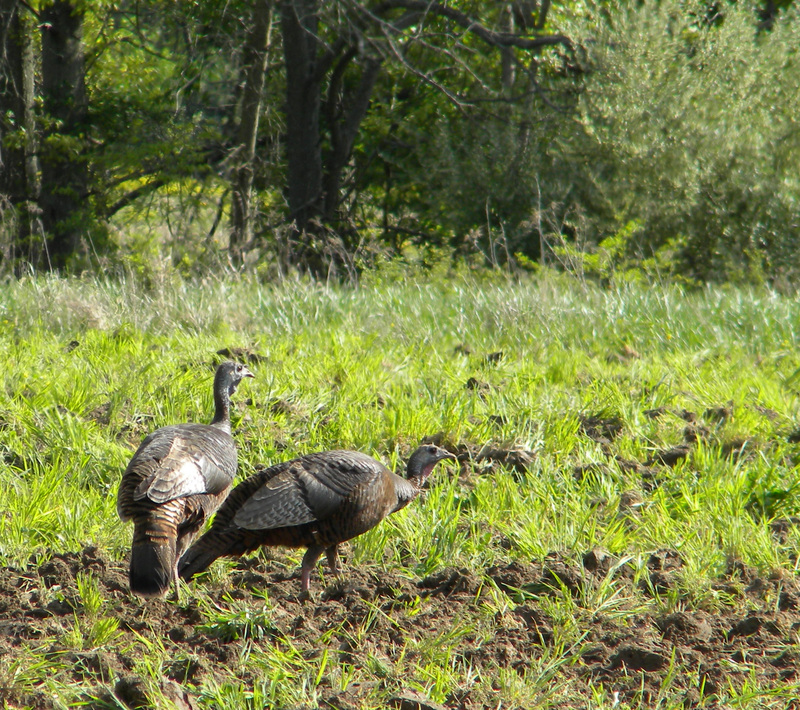 Most mating activity among turkeys occurs in April. Older gobblers establish territories and each then collects a “harem” of two to six hens. After mating, each hen goes off to begin her nesting. Nests are usually located in undergrowth that offers some concealment. Most are near the base of a tree or shrub which provides some overhead cover. If the first nesting attempt is a failure, many hens will re‑nest. The hen visits the nest once each day for two weeks to lay a single egg. During the latter part of this period she will spend several hours sitting on the eggs each day. What follows is a 28 day incubation process with the hen leaving the nest only once each day. This is generally early in the afternoon, to obtain food and water and sometimes to take a dust bath. Only about 35 percent of wild turkey nests hatch successfully. Predators sometimes kill the hens while they are on the nest. Agricultural and logging operations kill some of the hens. Some hens are startled by man’s intrusion and will desert the area. Once the young hatch, the hen remains with the brood near the nest. After several days, she will take them to an open area where insects, grass seeds, blackberries and a wide variety of plant material is available for food. Several hens and poults will join together and will stay together until the next spring. Fishing the heavy buck brush and shallow openings is a key to finding early season crappie. Sometimes anglers must pole their boats far into the shallows to find the big ones. All kinds of jigs work in water from 2 to 10 feet deep. Anglers probe the shallows with cane poles to more sophisticated fly rod tackle. Popular are spinning and bait casting rods and reels. The newer crappie poles are fast becoming the tackle of choice. Light line is a must. Two to four pound test clear line is best. If one is going to fish the heavy cover then perhaps 4 to 8 pound test clear line is better. Small jig and minnow combinations with jigs of 1/8 to 1/32 ounce are good. Plastic tube bodies of white, chartreuse, or red/chartreuse combinations seem to work well on jigs. 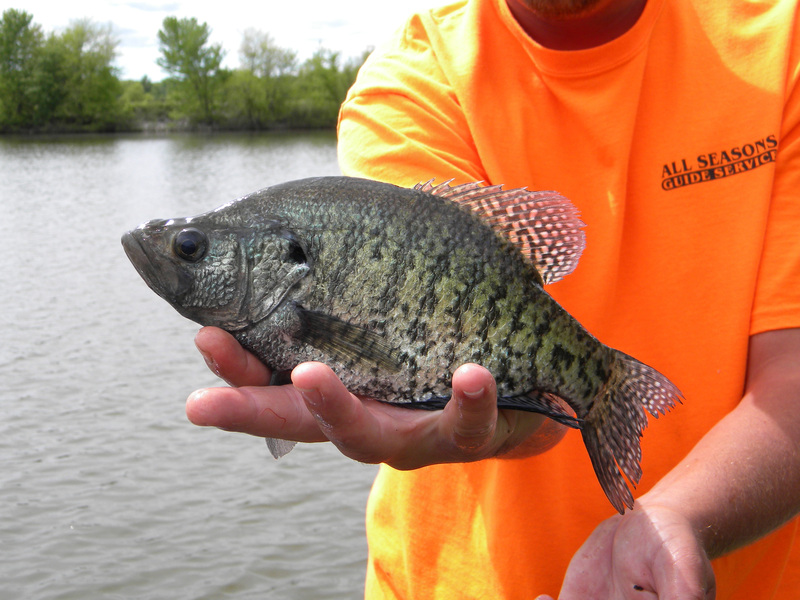 Some anglers fish for crappie along rip‑rap near dams and spillways with bank fishing tackle. This is a long pole, light line, and a small wire hook with a minnow suspended below a small balsa float. Allow the bait or lure to bounce along the bottom with an occasional jigging by the angler to entice a bite. The above is fine for the casual crappie angler. But, then there are the guys who REALLY want to get those big fish. You can tell them immediately. They have rods in the 9 1/2 to 12 foot length. The side of the boat is scratched from rubbing on the bushes. The long rods are sensitive in addition to being very long. They need the length to reach into the brush and the backbone to yank big fish up and out. The key is to fish straight down and straight up and keep a pretty tight line at the same time. A jig and minnow combination with a slip bobber, set at about two feet, to dip down in the middle of a real thick brush. The combo provides more weight to control going down and the wind will not hinder the action. Lake levels are usually high during the spring. This makes it just right for fishing bushes. The best is when the level is 2 to 3 feet above normal pool. If it gets higher, the fish get really back into the brush. That may require polling or wading and pushing the boat back as far as possible. You will notice scratches on the boats of the guys in the know. Early spring crappie fishing can be excellent. Nothing beats fresh crappie, taken from cold water, for the table. Whether you are a novice or a grizzled old pro, give it a try. Do you want to operate your boat safely and effectively this year? There is some preparation it needs done. It is not difficult, but necessary. It might even save money in the long run. Just because a boat sits idle all winter does not mean that nothing happens to it. Moisture collects, fuel can oxidize in the motor, and trailer wheel bearings can rust. One can take the boat to a marine dealer and have it brought up to snuff. An owner can do many tasks. Some of those things can trim boating costs. Make sure the engine is properly tuned, and keep it that way during the boating season. A well-tuned engine burns less gas. Proper maintenance extends the life of the engine more than making up for the cost of regular check up with the dealer. To run properly, the engine must use the right fuel. A lower grade gas may foul plugs and decrease performance. It also will use more fuel and increase operating costs. Cold weather has been hard on some of the boat components. Items such as ropes, motors, electrical equipment, etc. need checking repair or replacement as necessary. If done correctly, your boat will provide you with many hours of carefree enjoyment this summer. The first item is to check the steering system. Look for anything that prevents freedom of movement. Check the steering cables of wear, rust, kinks and bends. In checking the electrical system, it is important to make sure the battery is charged. Replace the battery if fails to hold a charge. Next inspect the entire electrical system for frayed wires. Make sure that all lines have proper insulation and connections are secure. Examine the trailer wiring for loose connections. Clean and lubricate the bulb receptacles. Next check the hull for any apparent damage or deterioration. If any hull damage is in need of repair do so right away. Check both the interior and exterior. This is particularly true if the hull contains wood. Cleaning the hull is also important for reducing fuel consumption. A clean hull will move through the water easier as well as handle better. Do not under-power boats if you are interested in fuel conservation. Manufacturers rate all craft for maximum horsepower and it is important to make sure you have enough motor to handle the load. Underpowered boats struggle to get on plane and require higher throttle settings to move the craft across the water. The result is poor fuel economy and an overworked engine. Speaking of performance a check the propeller is in order. If the boat is slow getting out of the hole or lacks top end speed, the prop might have damage or is the wrong one in the first place. The prop diameter and the angle of the blades (called pitch) can make a big difference in speed and fuel economy. Consult with your dealer for the right prop for you engine and its use. Local laws in every state require certain emergency tools. Check local regulations and make sure you are in compliance. Check, clean and properly store Personal Floatation Devices. There must be one for each passenger in the boat. The fire extinguisher should be checked to make sure it is properly charged and in working order. Navigation lights and signal devices should be in working order and properly installed or stored on the boat. A few hours and a few dollars spent prior to putting the boat in the water can avoid frustration on the water. More importantly, it can mean the prevention of death or injury to a loved one. Do not stop there. 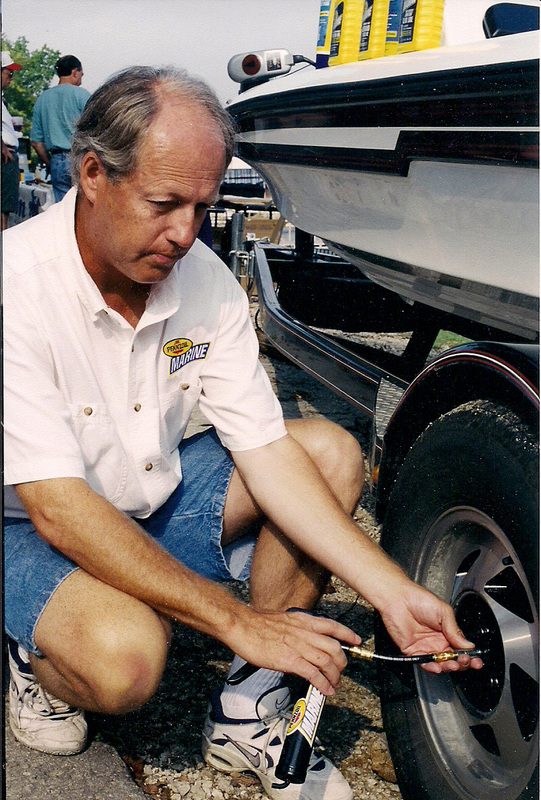 It is a good idea to check the wheel bearings of the boat trailer for rust and wear. If necessary, repack them. Check the light sockets, clean and lubricate if necessary. Check and clean all electrical connections. Turning to the tires, it is a good idea to check for wear. Replace any ties that show severe use. It is better to do that now rather than later during a trip to that favorite lake. If necessary, have them balanced. Look for rusted areas on the trailer. Now is a good time to clean them up and repaint. Check the trailer wench and replace the strap if severely worn. Lubricate the wench. It is difficult to begin a fishing season with these maintenance tasks. Following these few steps now will ensure that when you take your boat to that favorite fishing hole, the trip will not be marred with time spent doing repairs when you should be fishing.